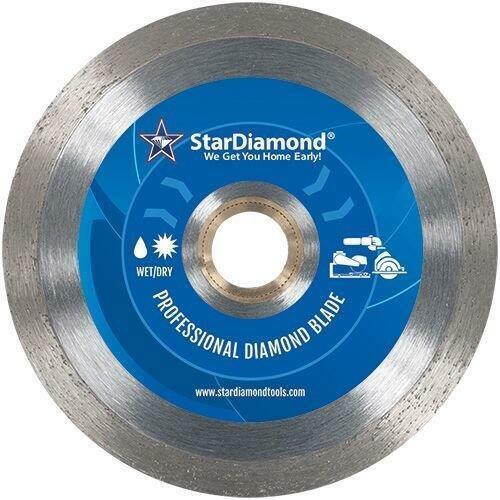 The Ultimate Tile diamond blade for Porcelain, Granite, Marble and Ceramic. The perfect blade for the professional stone/tile installer who wants one blade for all applications. The specially formulated cobalt matrix also features a heavy concentration of diamond. Fast and chip free cutting of Porcelain and Ceramic Tiles and other hard materials like natural stone and refractory brick. 10" x .080" x 5/8", 12" x .080" x 1", 14" x .090" x 1", 4.5" x .060" x 7/8" – 5/8", 4" x .060" x 7/8" – 5/8", 5" x .060" x 7/8" – 5/8", 6" x .060" x 7/8" – 5/8", 7" x .060" x DM – 7/8" – 5/8", 8" x .080" x 7/8" – 5/8", 10" x 0.060" x 1"-5/8"